Now your dreams can take flight! 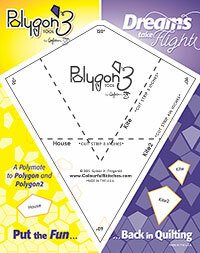 Polygon3 Tool adds the House and 2 sizes of the Kite shapes to the family. Shapes cut from a 3" or 4 1/2" strip. I did all the math for easy strip cuts and they will sew like a breeze with easy Butterfly Seam piecing. A compatible Polymate to both Polygon and Polygon2 Tools. With Polygon3 Tool, there are now 7 shapes in the family...you're going to love it. Let's put the fun back in quilting. Check out the newly release patterns that feature Polygon3 Tool: Prism, Bending Star and Five Rings.